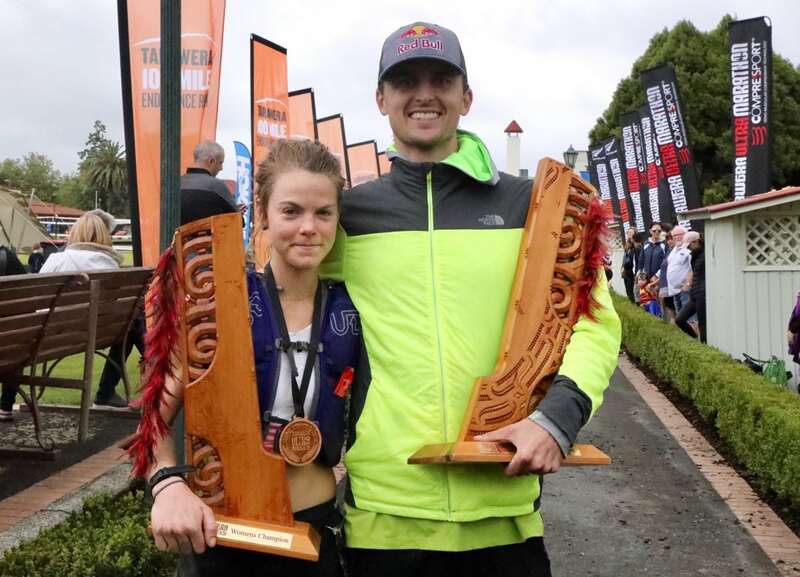 In rainy but warm weather and with difficult course conditions, Americans Kelly Wolf (post-race interview) and Dylan Bowman (pre-race and post-race interviews) each used their speed early and strength later to dominate the women’s and men’s fields and win the 2018 Tarawera Ultramarathon on New Zealand’s North Island. 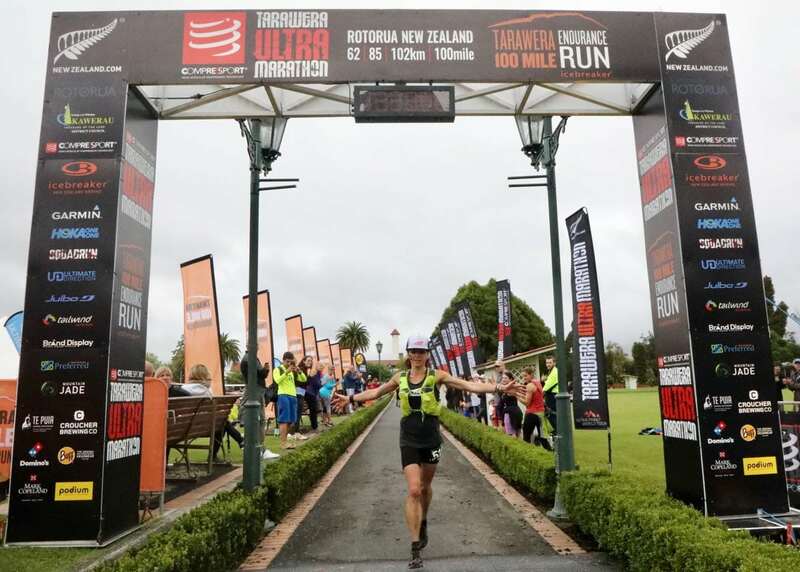 After nine years of traveling in a generally west-to-east direction between the towns of Rotorua and Kawerau on New Zealand’s North Island, the Tarawera Ultramarathon made a u-turn and switched directions for 2018. This course change brought the fast-and-fast terrain in the race’s first half and the more hilly and technical terrain second. 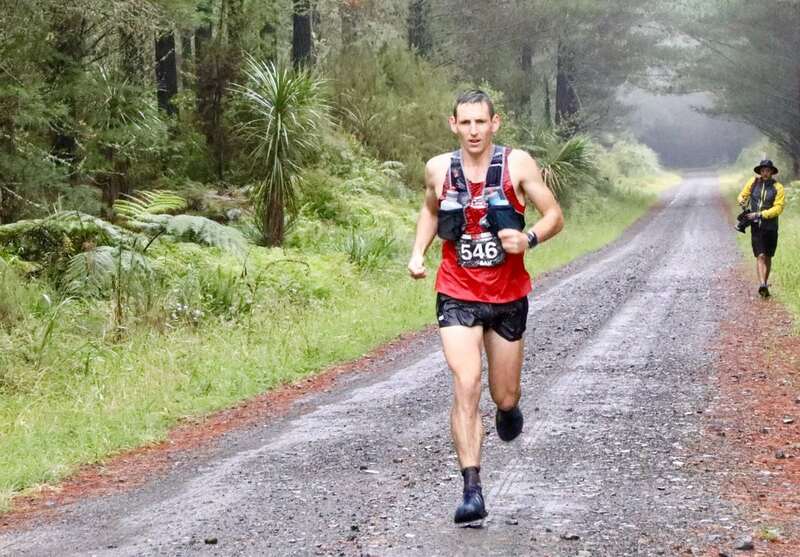 Many multi-time Tarawera runners said this new direction, which is net uphill, is the much harder way to travel. Additionally, a moisture-laden tropical storm made landfall about 24 hours ahead of the race, dropping loads of moisture both the day before the race and on race day. Mud, slippery rocks and roots, and flooded trails made the technical second half of the race even more so. It seems that the result of these conditions was that it was the jack/jill-of-all-trades runners–those with good leg speed and excellent strength–who saw the most success. If you enjoy our coverage of Tarawera, consider supporting us financially by joining the iRunFar family on Patreon. 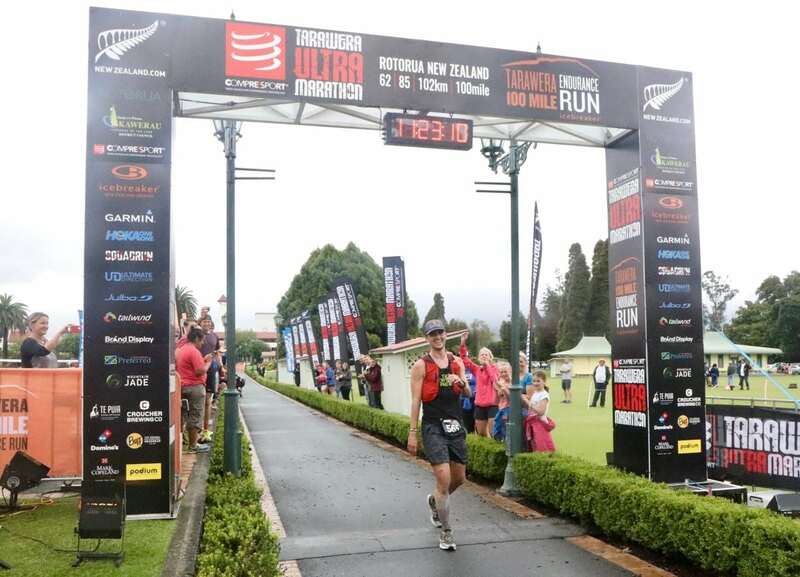 Your support makes our coverage of races like Tarawera possible… and so much more. Thanks for helping make iRunFar happen! 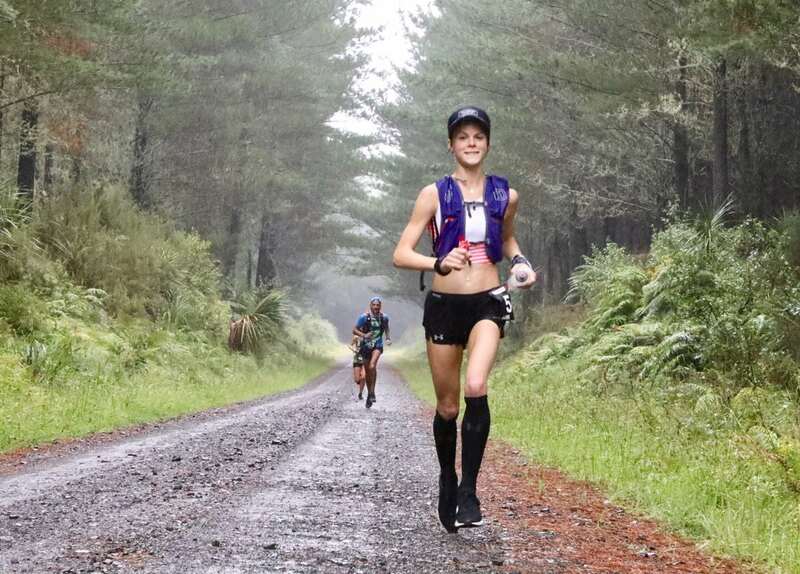 In the women’s race, American Kelly Wolf, (post-race interview), a first-time Tarawera runner, and two-time Tarawera champion Ruby Muir (pre-race interview) took the women’s race out fast, the pair leading the field through the 10.5-kilometer aid station in 42 minutes. (For the record, I believe that aid station was actually at about the 9.4k mark.) 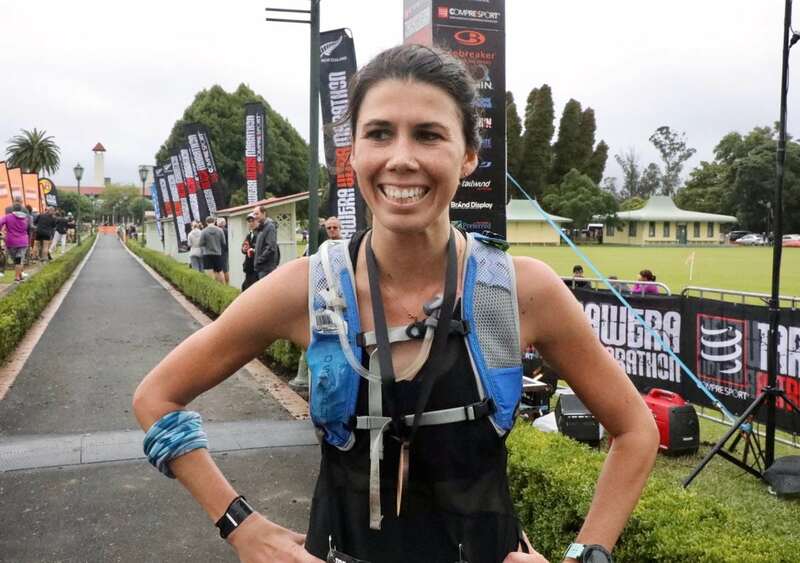 The pair was essentially together again at 26k, but then Kelly was all alone when we saw her roll through the 41k aid station at Tarawera Outlet, where she’d just put away those kilometers at roughly 3:25 marathon pace. For next 61k, it was the Kelly Wolf show, as she ran unchallenged by the rest of the women’s field, crossing the finish line in a mix of emotions. After a couple of years of building experience and success at trail and ultrarunning, Kelly put it all together to nail her first international-level win. Early in the race, American Amanda Basham (post-race interview) settled into third position, shadowing leaders Kelly and Ruby through the first two aid stations, just a short distance back. However, before the 41k aid station, she moved into second position and held it all the way to the finish line. The first thing she said upon finishing was, “I’m so happy to be done!” This was a familiar expression among runners, with the difficult weather and course conditions making an already challenging event more difficult. Amanda said before the race that 2017 had been a difficult year for her personally, in many respects, and that she was looking to put it behind her and have a strong 2018. Well, it’s early February and things are looking pretty well for her already. Some runners run focused and quiet. Other runners take themselves to deep, dark places to get the job done. Australian Erika Lori (post-race interview) seems to run happy. She bore a wide grin every time we saw her, despite rolling through pouring rain and through trails with sole–and soul–sucking water and mud. By the first aid station, Erika was in fourth position and she, too, would continue to run strong all day, moving up one spot to take third place. Courtney Pratt, of New Zealand, and Australian Lou Clifton rounded out the women’s top five. Early leader Ruby Muir dropped at 41k, citing stomach problems. Italian Cecilia Flori (pre-race interview), who lives in New Zealand and who took third last year, did not start the race due to illness. The men’s race went out hot, as expected. To be honest, I about died when the men rolled through the 10.5k aid station in 37 minutes. Sure, flat forestry roads basically connected the start line to this location, but that’s just obscene for a trail 100k. It turns out that opening aid station was actually about 9.4k into the race according to runners’ GPSes post-race. At that first aid station, American Cody Reed (post-race interview) led out the field and was shortly followed by Australian Vlad Shatrov, American Dylan Bowman (pre-race and post-race interviews), and New Zealander Sam McCutcheon (pre-race and post-race interviews). The next time we saw the men at 26k, the trio of Cody, Vlad, and Dylan had shook loose of Sam by about a minute. This trio would travel roughly together–with a slight accordion-style progression–until somewhere after the 50k mark when Vlad was the next to lapse behind the lead. At the Lake Okataina aid station at 58k, Dylan was all alone in the lead with Cody a minute behind. Some 22k later at Blue Lake, Dylan was up by a full 16 minutes, saying after the race that he pushed the climb right after 58k in an attempt to gap the field. In addition to pushing that climb, it seems that Dylan continued to navigate the difficult course conditions with a strength the other runners couldn’t match. It wasn’t entirely smooth sailing to the finish, as Dylan also navigated his own rough patch in the final 20k, giving back just under a half a minute per kilometer on Cody behind him between 81k and 97k. 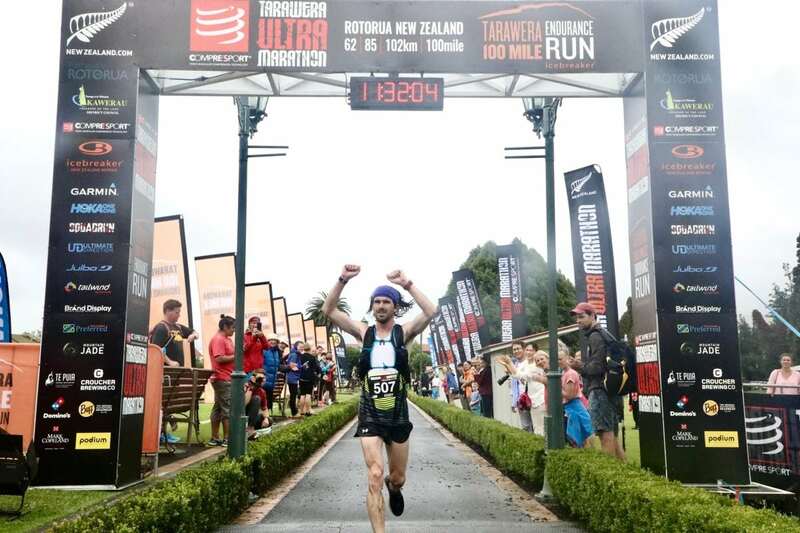 However, he pulled through that spell, moved swiftly over the final 5k, and crossed the line to win the Tarawera Ultramarathon for the second time (2015 post-race interview). Once Cody found his way to second-place position after the race’s halfway point, he held it and held off his competitors until the finish. Like Dylan, though, he said after the race that it wasn’t smooth sailing and that he was unsure about whether he would finish at times. At 58k, Cody held an 11-minute gap over third place, and at 81k, that gap had shrunk to just three minutes. He looked okay, but I wondered if he was okay enough. He said that, during this section, he was forced to walk a lot and he hit his head hard and had to sit down for a minute or two before continuing on. After the 81k aid station at Blue Lake, however, Cody caught another wind and ran strong to the finish line, with a commanding second-place finish. To race director Tim Day at the finish line, Sam said that this reversed course direction “…is way harder, mate!” However, there’s something about Sam that makes hard things look easy. At the 58k aid station, Sam was in fourth place, but he emerged at 81k in third and only three minutes out of second, a man on a mission. Though he wouldn’t be able to bridge the gap to second place, he moved smoothly during the race’s finally hilly kilometers to claim the third spot on the podium for the second year running. Vaidas Žlabys, of Lithuania, and Kyle Greig, from Scotland, took fourth and fifth. Vlad Shatrov, early race leader, slowed after the 50k mark, but still ran strong for sixth place. Thank you so much to Nat Thompson, Majell Backhausen, Vera Alves, and the two boat drivers who transported us safely along two lakes for helping make iRunFar’s coverage of Tarawera happen! Congrats to Sally Mcrae who won the 100 miler!